Living in the middle of Pacific Northwest Salmon and Steelhead Country, it's not surprising that my thoughts of fishing typically include large sea run fish. Washington State isn't really known for its trophy trout fishing. Since a very large portion of our streams give fish access to go to the ocean, it seems they usually opt out of sticking around in the river while they mature. This doesn't just go for rainbow trout (steelhead), but also our coastal cutthroat and bull trout. The streams of the western slopes of the Cascades, where I reside, don't support large populations of insects that trout and other resident fish rely on for sustenance. Hopping just over the Cascade Mountains to the East offers a very different climate; on the immediate downward slope to the East is a climate more reminiscent of Western Montana, and just to the east of that would fool some in to thinking they had teleported to Arizona. A vast change in climates that happens in 1.5hrs driving. Those Eastern slopes offer up conditions that are more favorable to things resident fish like to eat. But, due to the increased scarcity of water in that region, the number of rivers is much less than the Western, wetter side of the state. 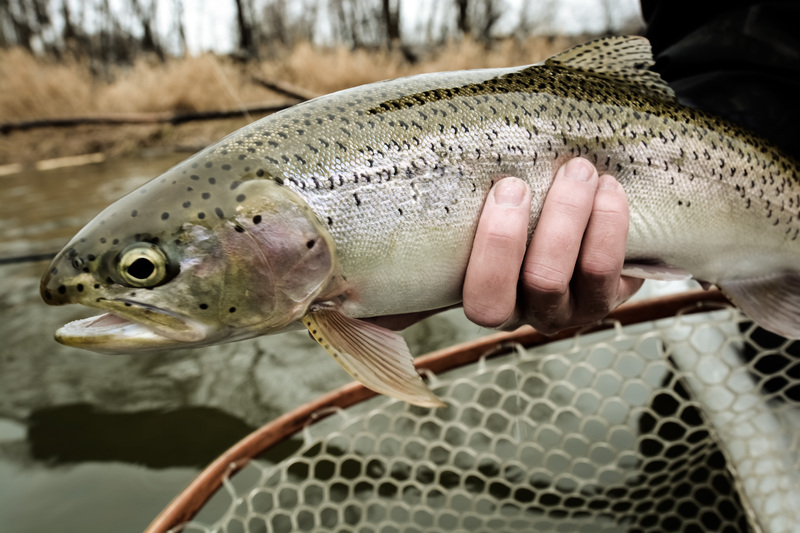 So the few rivers offering up some healthy numbers of native rainbows and cutthroat get a significant amount of attention. It's because of this reputation for crowded days that I've just never worked up motivation to go learn the rivers, and have stayed in my comfort zone of sea run fishes (though, some of those Eastern Slope rivers offer up some world class salmon and steelhead as well). The past two years I've developed an increasing itch to put down the heavy rods and grab my fly boxes full of insect imitations and go East. These intentions, however, often never went anywhere, as work and more familiar fisheries often stole my attention. This past weekend I finally committed and drove a mere 1.5hr East to meet up with my friend who had been guiding the Yakima River for about a year now. Conditions were not ideal. As I crested Snoqualmie Pass, the rain was torrential to the point of slowing my driving to be able to see. My first glimpses of the upper Yakima River showed thick, brown looking water raging its way down toward my destination. I was not encouraged to say the least. I did some looking at river guages on my phone as I drove (maybe not the wisest decision given the driving conditions) and saw the guages down at my destination weren't spiking yet. There was about 60mi of river between my current location and my destination, so I soldiered on. The boat launch for the start of our float had perfect looking water with great visibility. So we committed to the float and immediately started catching fish. We also noticed we were the only boat out there, not something this river is known to allow to happen often. So we got first crack at all the good holes, pulling in some healthy rainbows in the 15" to 18" range. I even managed to bring my "steelhead mojo" and caught a rare wild upper Yakima steelhead. Only a couple hundred steelhead make it over Rosa dam per year, and you're talking about 1 or so steelhead per two river miles. So it was not an expected event to take place. (I'd like to add that Yakima steelhead are rare and protected. Targeting them is not something I endorse. This fish was merely an unexpected by-catch). Having the river to ourselves in the middle of the March Skwala event was a great experience, despite the conditions (we had to race down stream to stay ahead of the mud flow). I'm re-gaining my interest in trout fishing, and may make it my go-to game during the Feb-May time period, given I'm becoming less a fan of the steelhead fisheries of that time period. It's a reminder that a fish doesn't need to be 25" or bigger to give you a great day. That targeting actively feeding fish in our local rivers (which salmon and steelhead are not) is a very different experience and makes you think in ways that you don't get to while fishing for the anadromous fishes.